Little Image Viewer is a portable lightweight application for viewing popular image file formats and with some extra features. 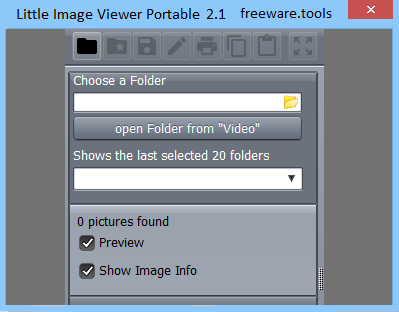 Little Image Viewer Portable is a free image viewer featuring your standard, useful functions as well as a unique feature which extracts images directly from audio files (such as Amazon MP3 files). The free image viewer displays an easy to use, intuitive interface, in addition to a handy right-click menu which allows you to quickly view and use various functions. In other words and simply stated, you can view photographs and edit them with this compact and lightweight tool that offers basic image operations such as rotation, flipping, or resizing. When dealing with multiple images, users might be tempted to resort to complex graphics suites. However, there are other, more accessible image handling applications out there and one of them is Little Image Viewer Portable. A more lightweight and compact version of Little Image Viewer from the same developer, it will offer people an easy way of viewing images and edit them, “on the fly”, even from USB devices. Little Image Viewer Portable presents users with a clean interface that features dim theme throughout its entirety. People will have no trouble in adding the preferred images to the viewer, but unfortunately, the same as with Little Image Viewer, this version doesn’t offer drag-and-dropping. Once the favorite files have been loaded, people will be able to navigate through them with ease and quickly perform basic operations such as rotating, flipping, or resizing. Offering the same intuitive tab-array, it will enable users to preview images individually or manage them in their corresponding directories. Being portable means that people will be able to use it from any device they prefer, this way avoiding unnecessary installations and configurations. In addition to its core feature, which enables one to preview images, Little Image Viewer Portable also offers a dedicated image extractor. By using this feature, people will be able to easily identify and extract artwork from audio files that have album art attached to them. For a basic image viewer this is quite impressive and it might be useful for those who enjoy the album covers for certain music files. t will offer a straighforward package, which provides an easy handling and quick image preview. One extra feature of Little Image Viewer Portable will allow users to extract image content from album artwork of audio files.